The lighting is a little red, but the food is more than a little good. For a friend’s birthday, we headed out to Salsa and Beer in Lake Balboa to eat some birthday Mexican food. Having never really been to Lake Balboa and having mostly heard sketchy things about that part of town, I wasn’t entirely sure what to expect from Salsa and Beer. 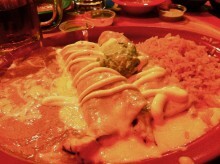 Yet, some of the best Mexican food I’ve ever had has come from sketchy places, so my expectations were somewhat mixed. As soon as I walked in, though, I had a feeling this was going to be a great meal. Looking around, I saw happy faces and giant platters of Mexican food. On top of that, my sense of smell was sending me strong messages. Once the rest of our group arrived, I finally got a chance to look at the menu and was floored. First I was floored by the sheer size of the menu. Figuring out what to eat wasn’t going to easy. Once I started looking around, I realized the prices weren’t going to make things any easier, because everything was damn cheap.